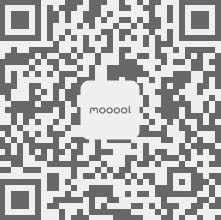 Thanks Carve for authorizing the publication of the project on mooool, Text description provided by Carve. 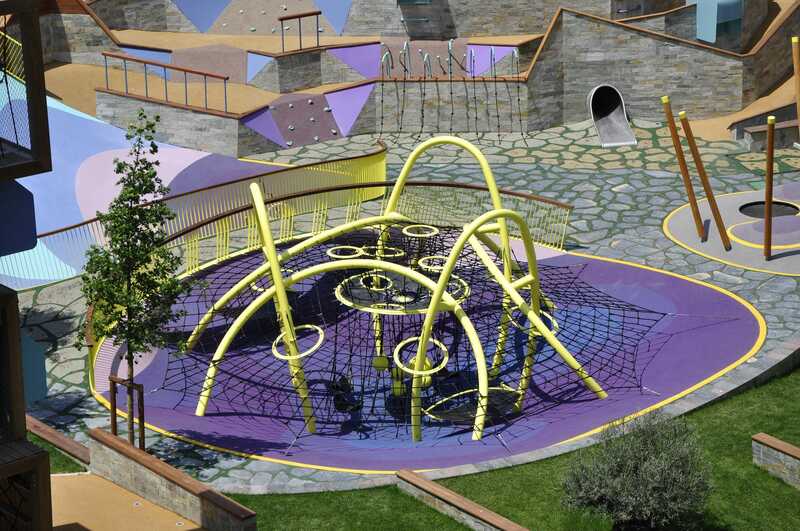 Carve：The starting point for Carve’s design was that we wanted children to be able to completely dive into their own world of imagination: stimulated by otherwordly shapes, colours and an unprecedented play experience. 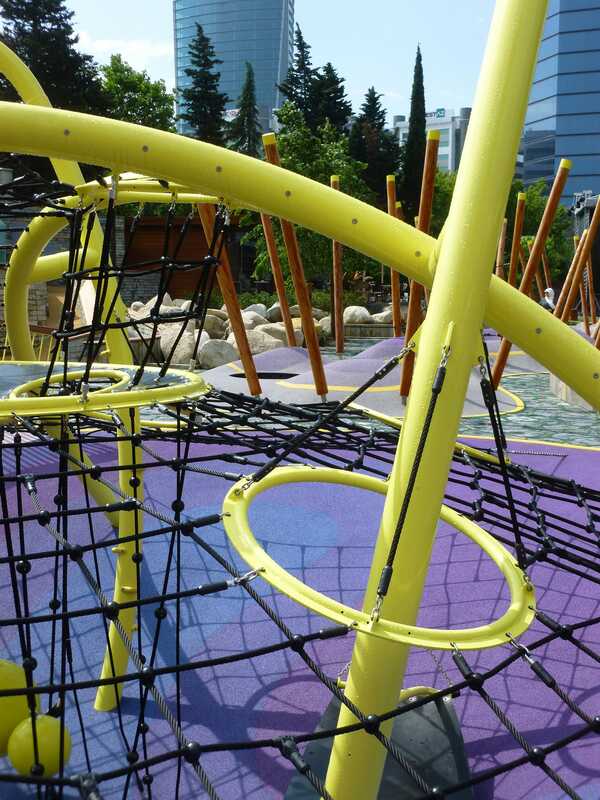 It should be a playground visible from afar, yet a world in its own right. 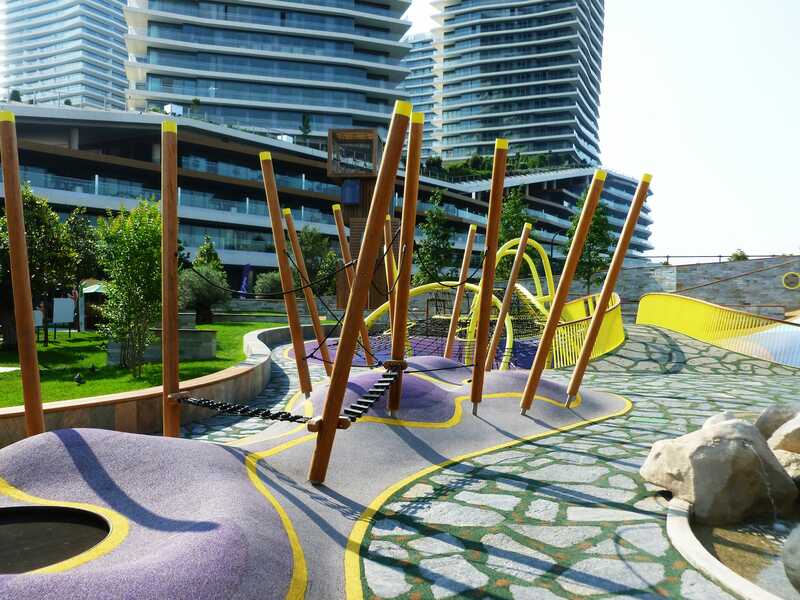 This resulted in a playground that is truly one of a kind: everything, from concept to layout, from play equipment to landscaping, was designed specifically for the Zorlu playground. 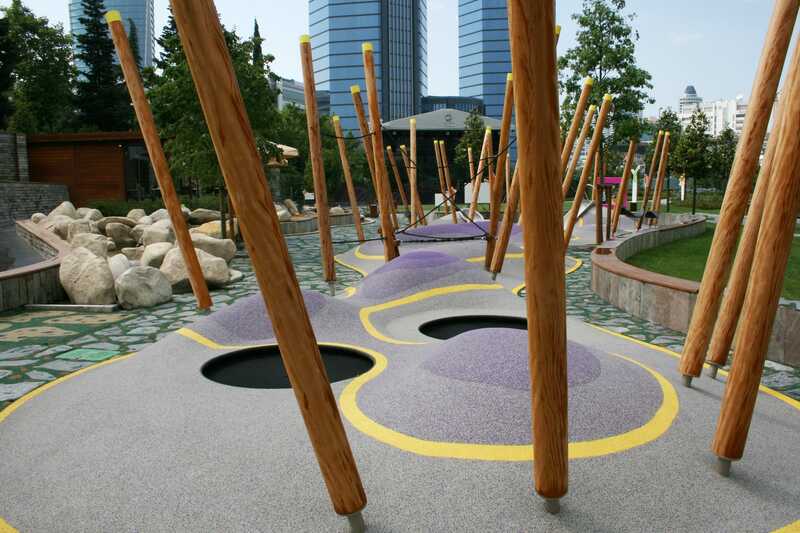 With this, Zorlu Center offers a unique chance to create a backdrop for unforgettable play experiences. 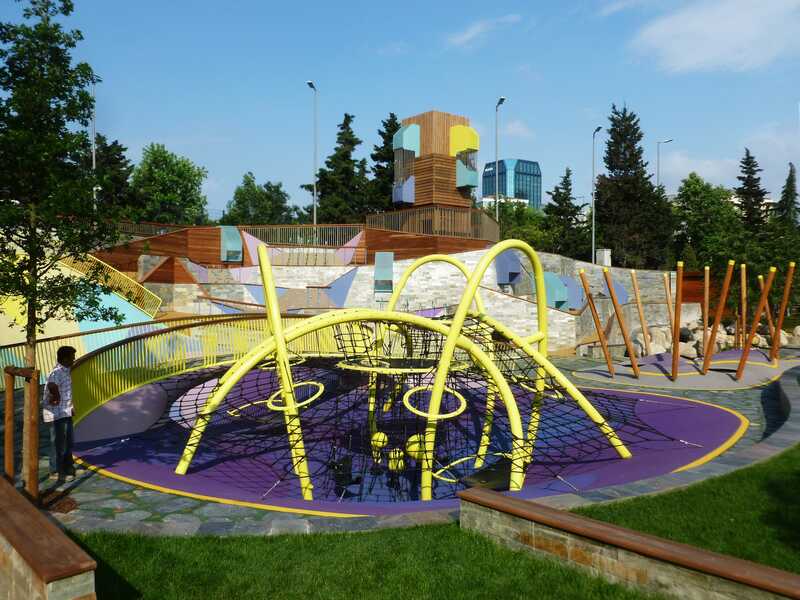 The playground consists of various zones and changes its look: from low, bright and colourful at the entrance zone it gradually transforms into a more adventurous, high and natural looking play environment. 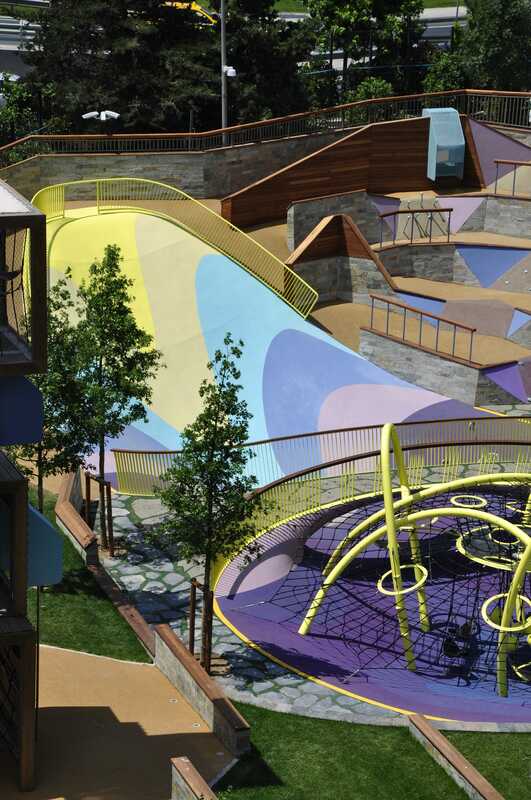 Within this gradient, the playground is divided into different ‘worlds’, who all have their very own character. 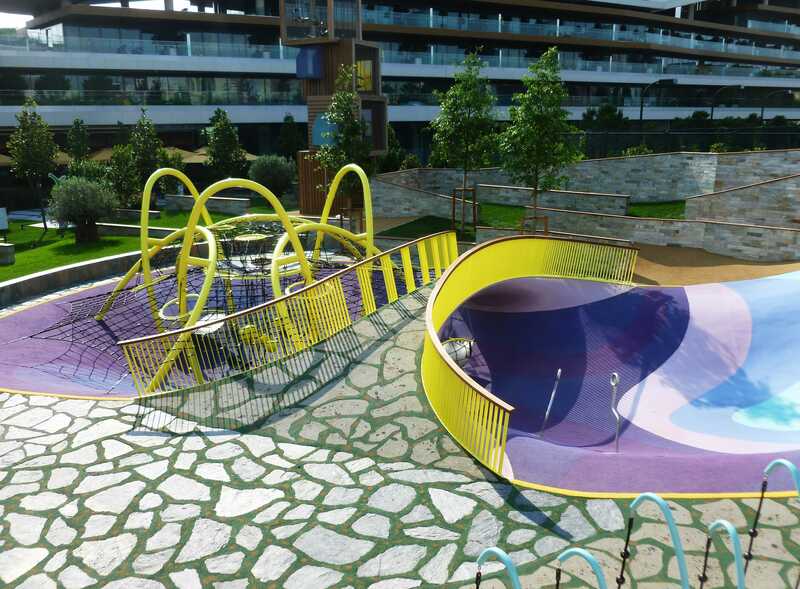 While the parents are sitting on the neighbouring terrace or the elongated bench that embraces the playground, children can safely explore the whole playground on their own. 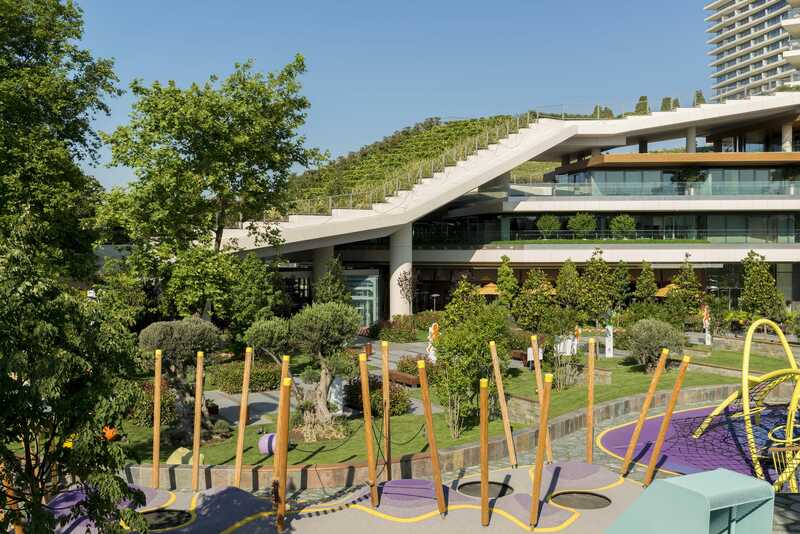 The entrance area is dedicated to young children, with gentle hills to climb on, slide down and explore. 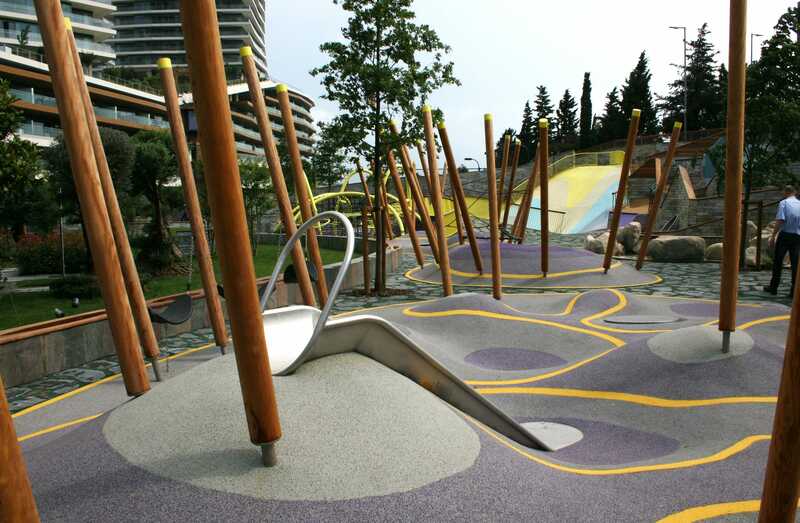 On these hills, capricious playshapes host numerous playelements for the smaller children, like trampolines, spinners, climbing nets, hammocks and a slide. 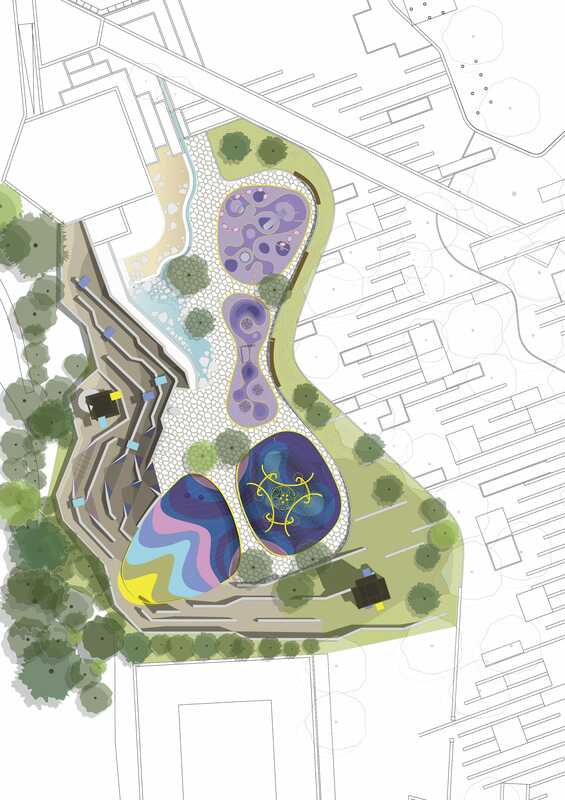 The wavy shapes of the hills reflect the shape of the neighbouring waterplayground. 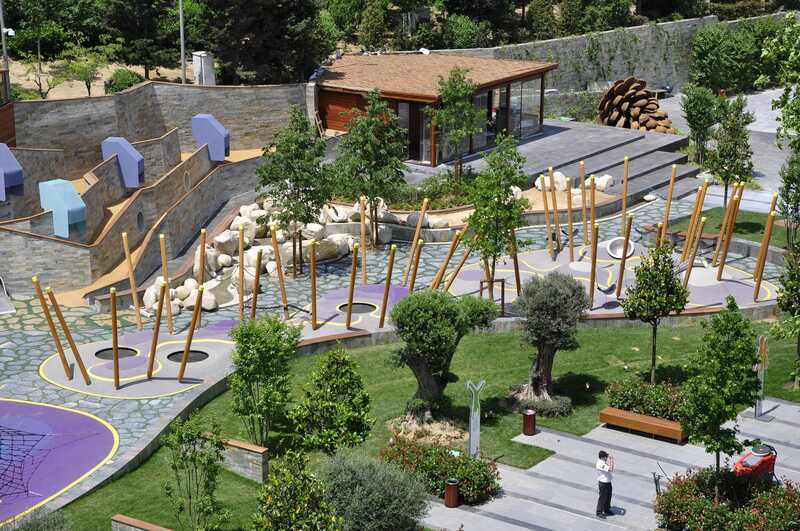 In the wooden poles lighting elements are integrated. 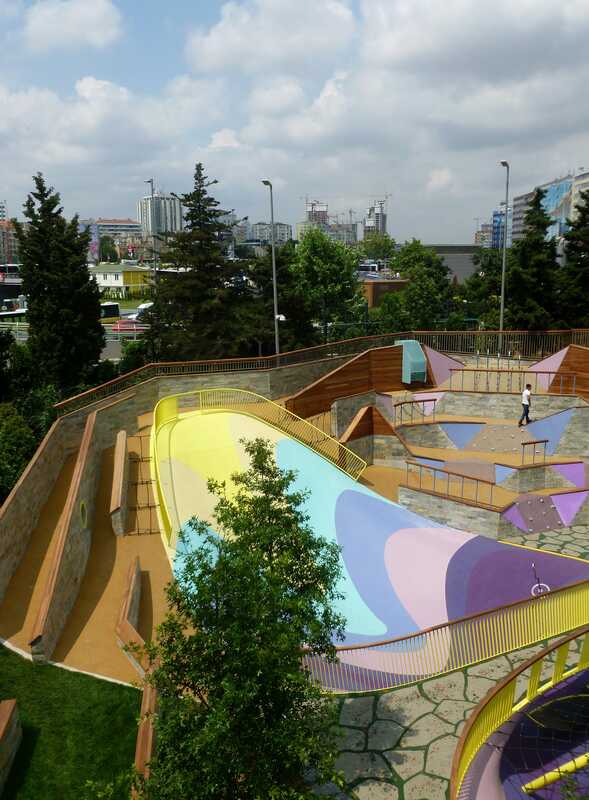 Moving towards the heart of the playground, the hills turn into valleys. 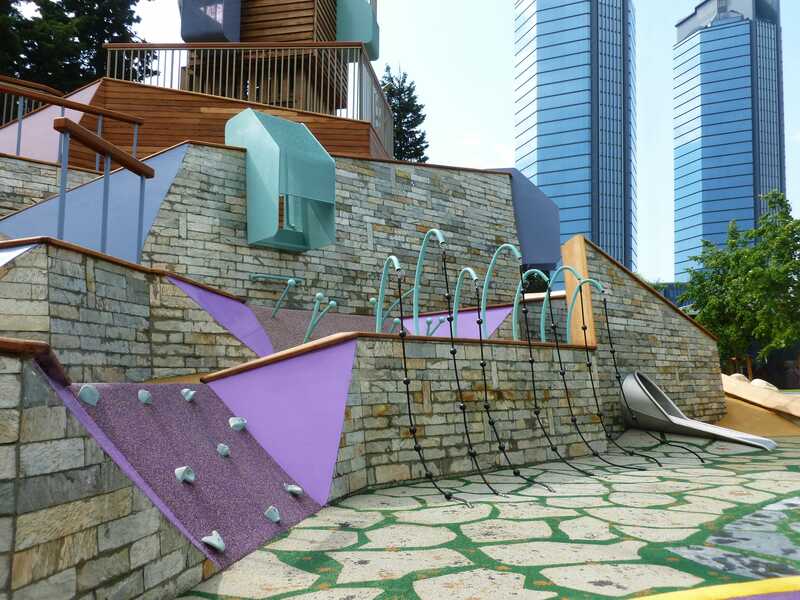 Here, a hidden world can be explored: a bridge, giant netting structure and a giant family slide, ready to be used by a whole bunch of children at the same time. 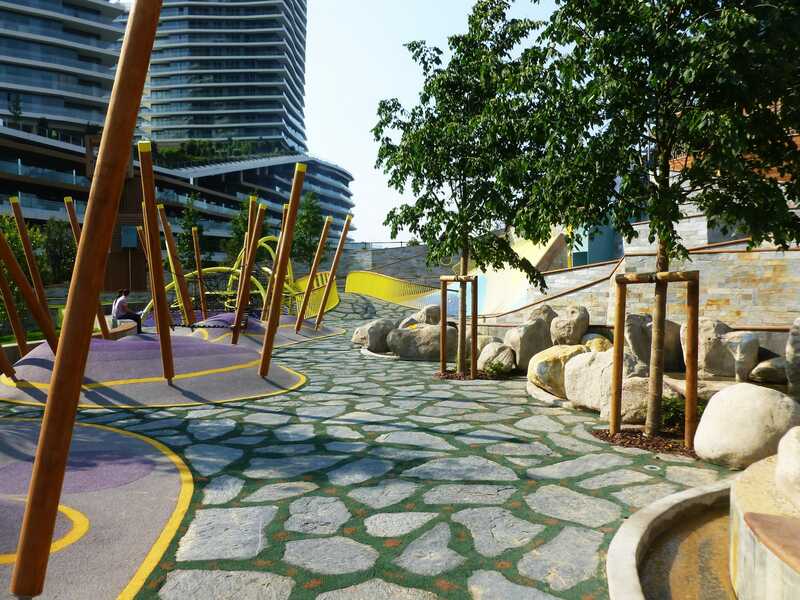 The site is embraced by a natural landform, keeping children safe in the playarea. 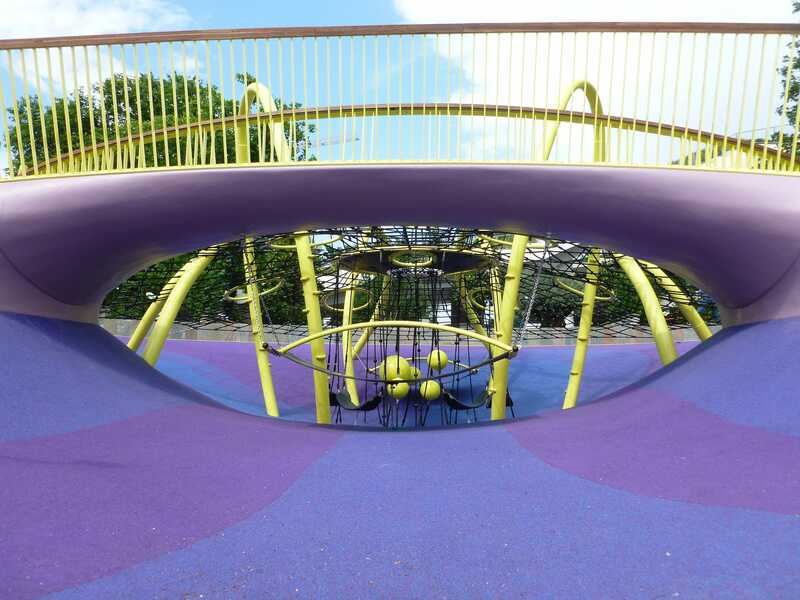 The climbing nets and family slide are the eyecatcher of the playground; brightly coloured and visible from afar, this zone stimulates the adventurous and explorative nature of children of all ages. The deep valleys are embraced by a ‘mountain range’. 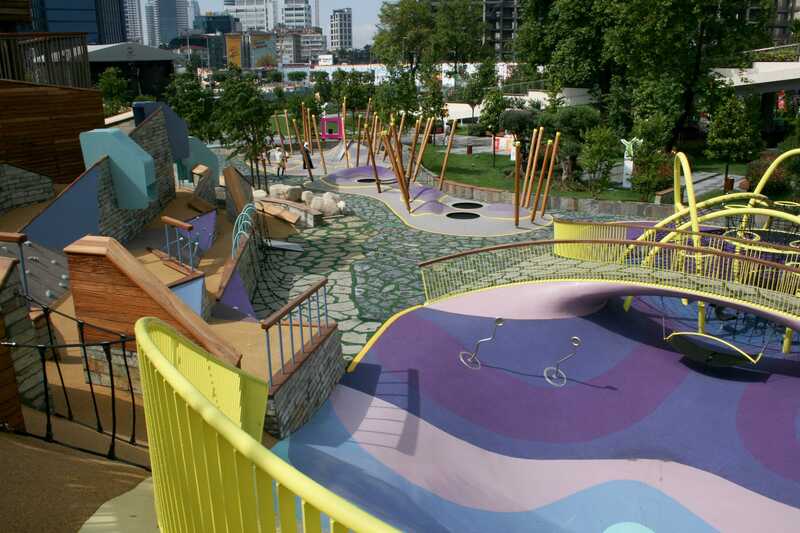 Several rows of walls contain an endless amount of play possibilities, from climbing, running, hiding, sliding and crawling to playing hide and seek and diving into a completely other world, overlooking the rest of the playground. Together these walls act like a giant coulisse, which changes shape depending from one’s angle. It is an adventure to play here: a labyrinthic system of tunnels, sliding walls, ‘birds nests’ and lookout points and narrow alleys. Once you’re inside the mountain, there are numerous ways to get up to the highest point. 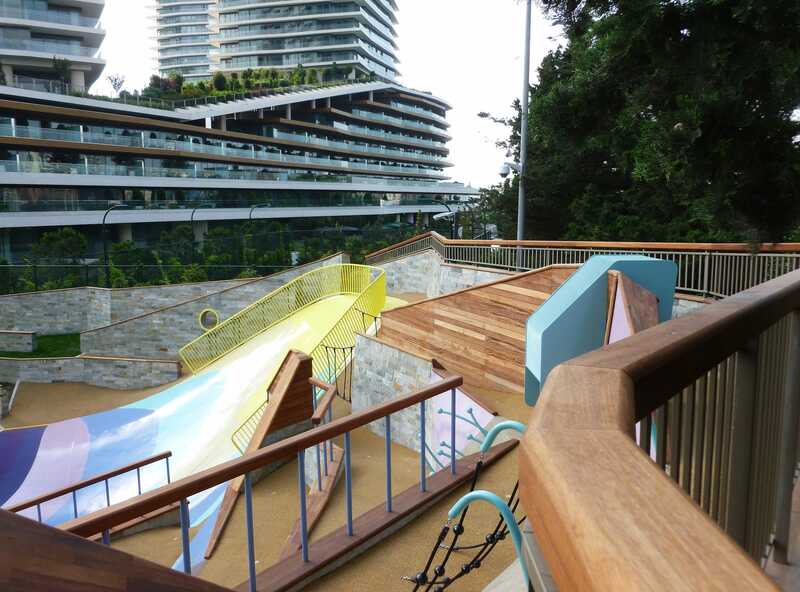 The giant slide from the valley-landscape crawls up the hill, connecting both parts of the playground. In a rollercoasterslide of seconds, you’re in the heart of the playground again! 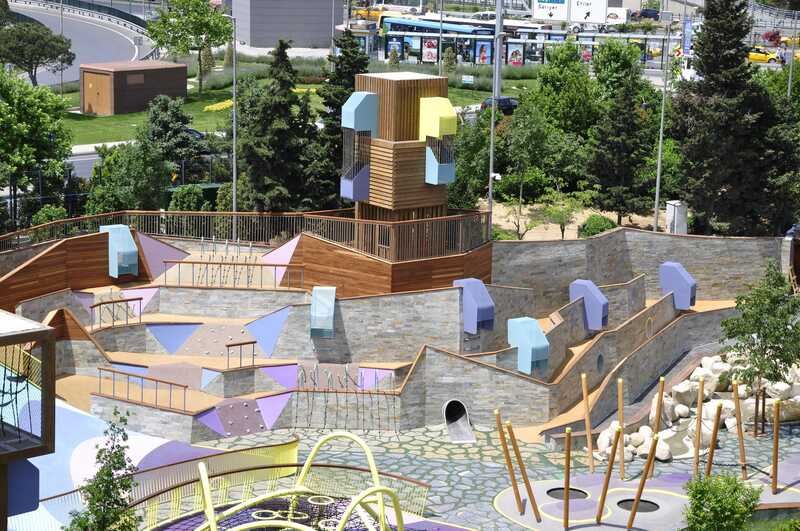 On top of this all, the playground contains two towers from which you can overlook the whole playground. They differ in size and ability level, but are unmistakenly part of one ‘family’. Transparent and non-transparent routes offer an endless amount of possibilities to go up! They are made of large stacked cubics cladded with wooden slads. 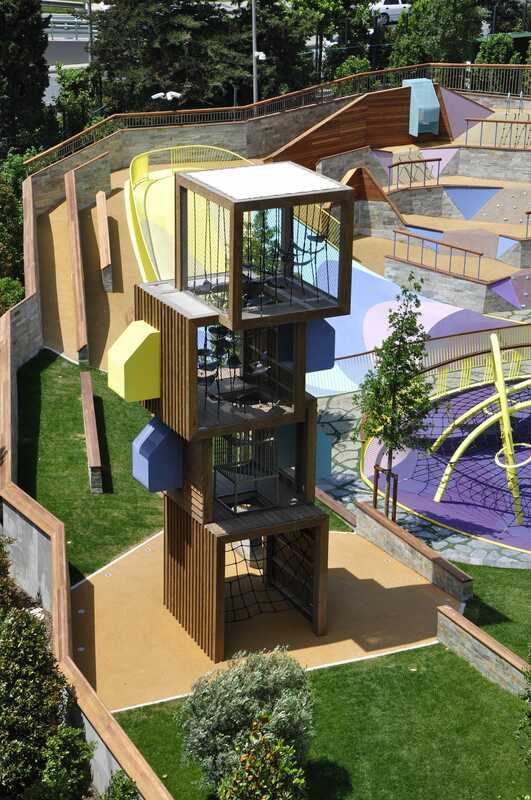 The three storey tower sits on the highest part of the playground and contains a long slide which only can be reached by climbing up the mountain range. 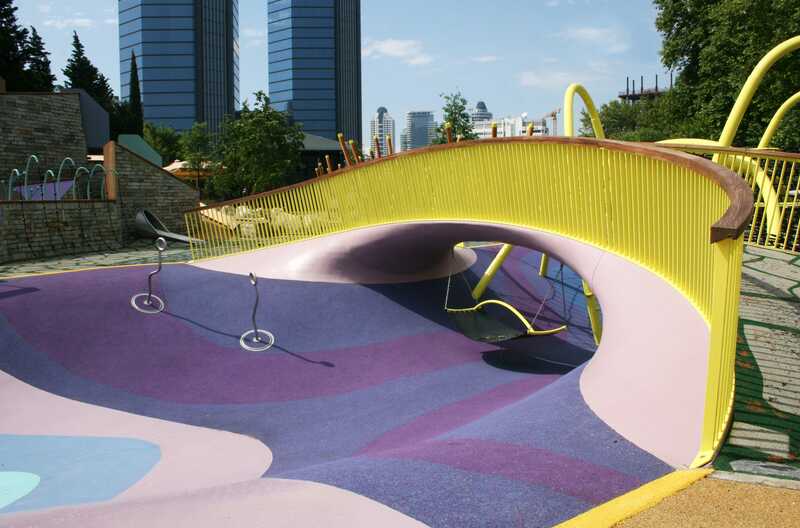 The slide dives partly underground, covered by the hill – withing seconds, children can slide down to the heart of the playground. 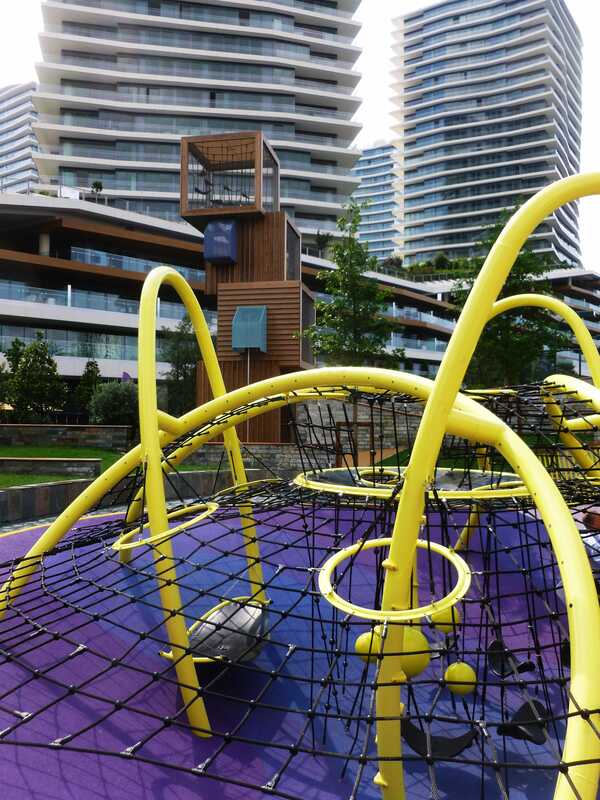 The ‘birds nests’ that are part of the mountain landscape are also integrated in the towers. 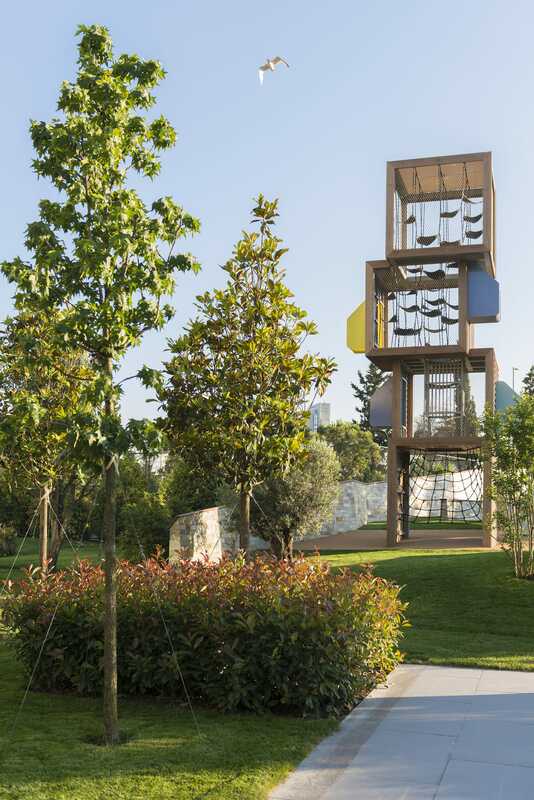 They function as hidden lookouts; children can climb in there and hover above the ground. 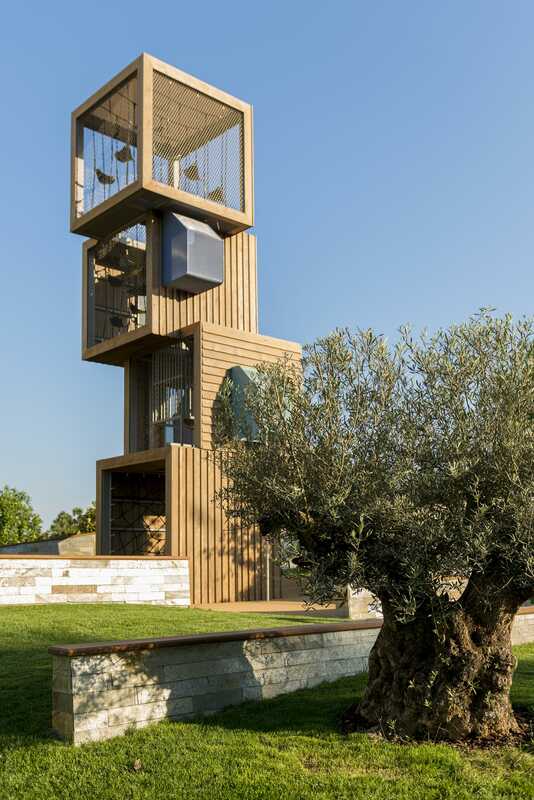 The second, four storey high tower is equally transparent and also has an interior which is focused on climbing, hiding and lounging. 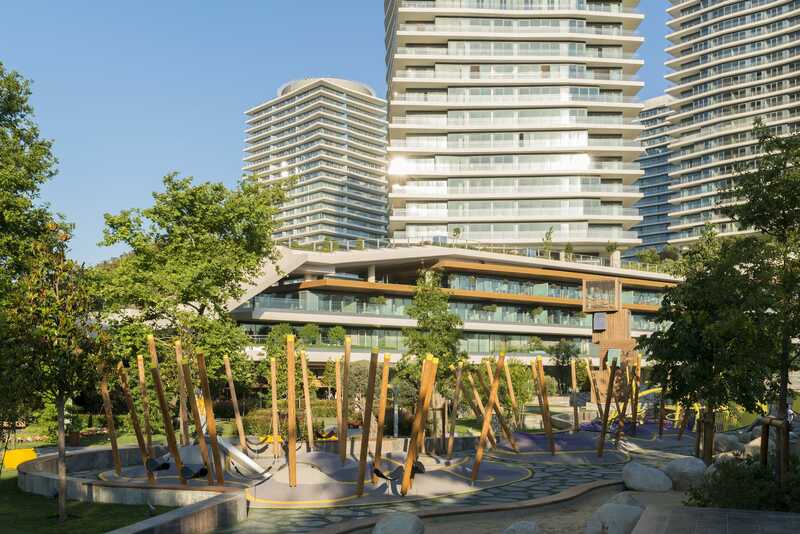 The Zorlu stands out in the way it was planned: in a very short time span, the project was designed, engineered and built. 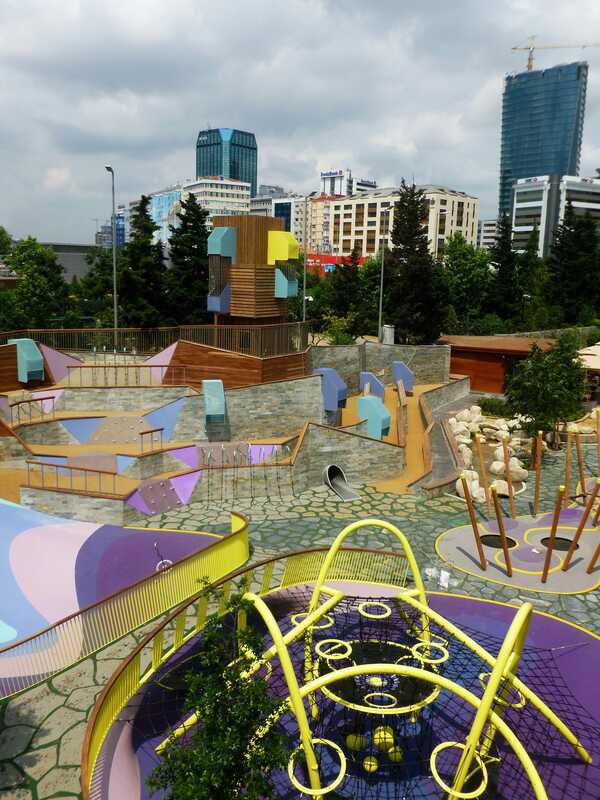 Thanks to all parties involved, the Zorlu Playground surpasses all expectations; it is more colourfull, dense and challenging than one could have imagined. But most importantly, it succeeds in merging two important design themes. 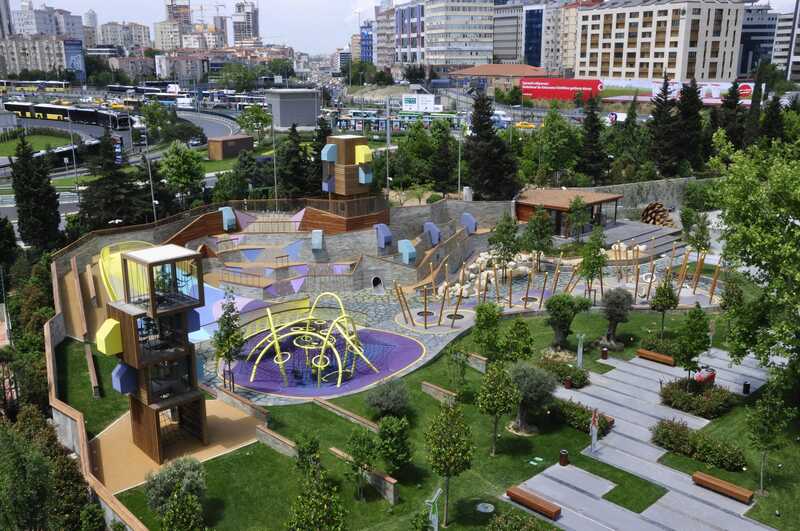 First of all it is a playground in which children completely can dive into into an imaginative world, while secondly, seen from the outside and despite its colours and unusual shapes, it merges beautifully with the surrounding landscape.